The Outer Union Set operator is the fourth Set operator in Proc SQL. It is very different from the other three that we have discussed. 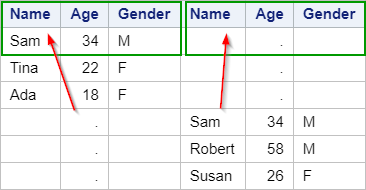 It concatenates the tables by selecting the rows from each input table. 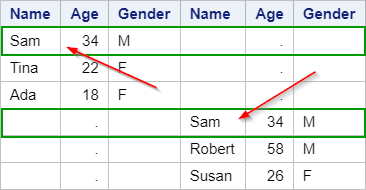 However, duplicate rows are not removed and columns are not overlaid by default. We have seen the CUST1 and CUST2 tables from previous sections. Each of the CUST1 and CUST2 tables contain three customers. Now, let's concatenate the two tables using the Outer Union Set operator. The two tables are concatenated into one. However, it looks quite different than the other concatenated tables we have seen in previous sections. 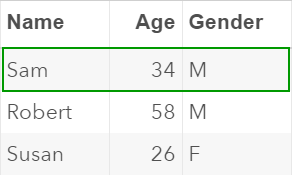 Second, none of the columns are overlaid, even when the columns have the same name across the two tables. The Outer Union Set operator is a different beast than the other set operators. However, you can still use the CORR keyword to overlap the columns with the same name. The CORR keyword is added after the Outer Union Set operator. The code above will give you the same result as using the Outer Union operator with the CORR keyword. Using the Proc SQL technique usually requires more computing power. ​However, it could be more flexible than using the SET statement when dealing with the more complex situations that involve multiple tasks to be done within a single step. Note 2: the ALL keyword cannot be used with the Outer Union Set operator. As we have learned in the last section, the ALL keyword is used to tell SAS to NOT remove duplicate rows. By default, the Outer Union Set operator keeps the duplicate rows. Using the ALL keyword along with the Outer Union Set operator will result in an error. The TEMP1 and TEMP2 tables each contain 4000 rows. 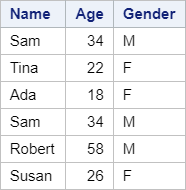 Use both the SET statement and the Outer Union operator to concatenate the two tables. Already a member? Go to member's area.